This Changed Everything: 500 Years of the Reformation celebrates the fruits of the Reformation while exploring difficult questions about the cost of division: Could schism have been avoided? Is there hope for reunification? What did Jesus really mean when He prayed for His followers to be "one"? 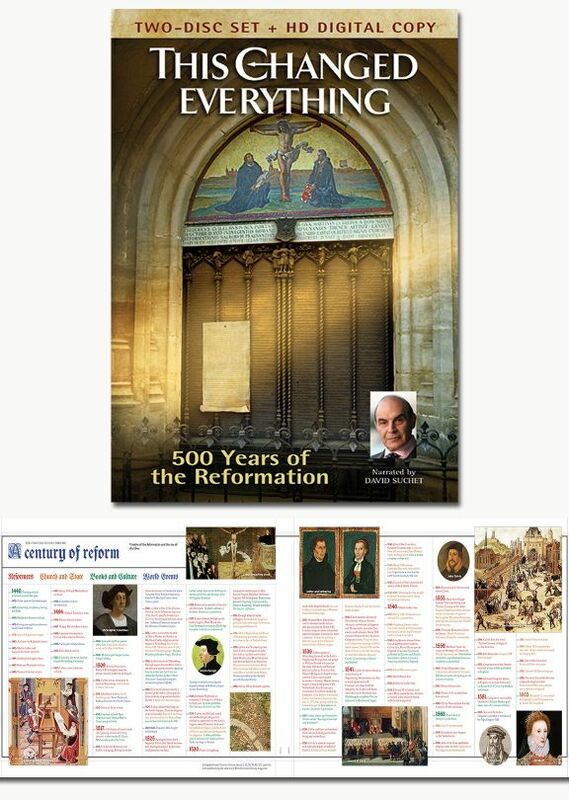 Includes a FREE Reformation Timeline. In this visually rich, three-part documentary series hosted by actor David Suchet, leading church historians share fascinating insights and pose vital questions about unity, truth, and the future of the Christian church. Among the experts featured in this series are Dr. Frank James, Dr. John Armstrong, Dr. Michael Horton, Dr. Jacqueline Rose, Bishop Robert Barron, Mark Galli, Dr. Joel Harrington, Shane Claiborne, Dr. Karin Maag, Dr. Scott Kisker, and many others. Bonus material on Disc 2: Over five hours of interviews with experts, virtual tours of key Reformation sites, companion guide in PDF. An interactive guide is also available at www.ThisChangedEverything.com/companionguide.